Exercise can have many physical benefits, including better energy, fitness, cardiovascular health, and muscular strength and endurance. But did you know that it can help with side effects of cancer treatment such as fatigue, pain, depression, anxiety and stress? Exercise comes in many different forms. Aerobic activity, such as walking, jogging or swimming, uses your larger muscles (arms or legs) to increase your heart rate, improve blood flow and strengthen your heart and lungs. Resistance training, for example lifting weights, works to build and strengthen your muscles while activities like yoga or Tai Chi, focus on your balance and flexibility. Whether you exercised regularly before your breast cancer diagnosis or not at all, physical activity may be beneficial for your health and wellbeing during or after your treatment. Since everyone is different, it is important that you talk with your doctor first to determine how and when you can start exercising. 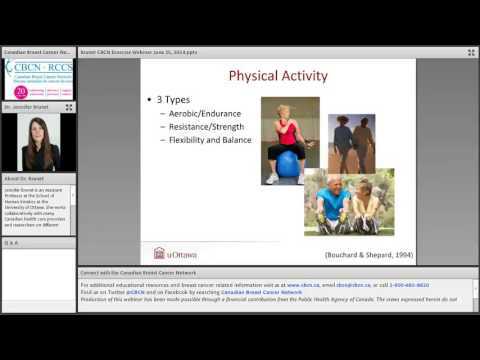 Watch our webinar on Getting and Staying Active after a Breast Cancer Diagnosis with Dr. Jennifer Brunet for a better understanding of how living an active lifestyle can positively affect your quality of life and also help to reduce your risk of recurrence. Or you can read her tips on getting active on page 14 of Network News Fall 2014. Our new white paper: what are patients and physicians saying about biosimilars in breast cancer?